At the end of a long day, nothing is better than curling up on the couch with your favorite dessert! I love dessert, and I am sure you do too! Since I try to stick to the three-hour diet and eat every three hours, I generally end up eating dessert every night, especially the nights I stay up late. This doesn’t mean I eat ice cream, cookies, and cupcakes every night! I try to keep my desserts healthy or eat something with lean protein, healthy fats, or veggies! One of my favorite things to make a dessert with is egg whites! I make a lot of different egg white recipes that are yummy and easy! This chocolate peanut butter egg white recipe is perfect for your late night sweet craving! Get the recipe now and try it for yourself. 1. Blend together six egg whites, stevia, unsweetened cocoa powder, and almond milk in a blender. 2. Cook this mixture like a pancake in a skillet. 3. 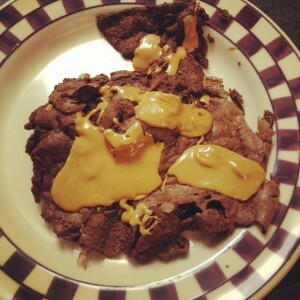 When it is done, put the egg white pancake on a plate and top with a tablespoon of natural peanut butter! This is a tasty way to have a healthy dessert. I love making these simple desserts with egg whites. Not only are the tasty and satisfy my sweet tooth, but they are also healthy! In fact, eating desserts is actually important to losing weight and offers benefits to your health! I eat every three hours. So, when I stay up late, I will eat dessert and continue eating every three hours. This will my metabolism stays revved up! Eating dessert daily can help you with your diet! Can you believe that!? By allowing yourself some of your favorite treats regularly, you will have a better relationship with food. It will allow you to view food in an emotionally healthy way, rather than something that helps you through stressful times and bad days. Some people try having a “cheat meal” while on a diet. I have been here before, allowing yourself a pizza once a month seems like a great way to stay away from your favorite “unhealthy” meals, but really this can backfire. When you have stayed away from your favorite food for so long, do you really think you can have self-control and only have some? No! You are going to eat and eat some more until you feel disgusting. We have all been there. By allowing yourself dessert, you are more likely to not indulge and stuff your face with your favorite sweet treats! While I try to eat healthier desserts, many articles state that it does not matter what type of dessert you eat as long as you don’t overeat it. In fact, the foods you should be more worried about are the ones that are sneaky about containing sugar! Protein bars, cereals, packaged foods, bottled coffee and tea drinks, and other items you may consume daily are hiding the fact that they contain sugar. They are trying to trick you into thinking they are healthy, but really they could contain as much sugar as your favorite dessert that you have been avoiding on a daily basis. Being aware of where your sugar is coming from is a great way to cut back and make your diet healthier. You should know that your dessert contains sugar, and you should not feel guilty eating it daily! But you should try to cut back on sugar in other produces. Try to eat more fruits and veggies daily. Add more whole grains and lean proteins to your diet, and enjoy your dessert every single day! Rather than cutting stuff out of your diet, simply work on portion control. Measure out a serving size and don’t allow yourself back for more. Cut sugars in other areas of your diet. Not only will doing this help make your diet easier to stick to, but it will also help you not view food as a negative thing! You can also try these chocolate peanut butter egg whites for a yummy and “healthy” dessert. They are easy to make and can allow you to enjoy some sweets before bed. You can find more of my recipes here! Enjoy your dessert every night, you won’t regret it! I know I don’t!